Dietz may be the most frustrating pitcher in the organization outside of Hunter Harvey. When it comes to raw stuff, you could argue that Dietz has the best stuff in the organization. He touched 100mph in spring training, and was as high as 99mph as a starting pitcher during the season. He sits 94-97 with significant armside run. He also has a slider (84-86) that can be anywhere between fringe average and plus depending on the start. His changeup (85-87) really improved this year, developing into a bat missing weapon with late tumble. 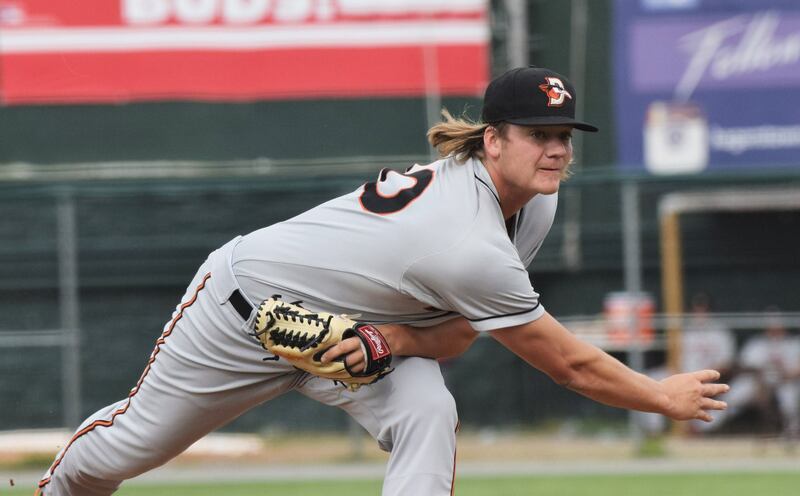 I saw one start this year where he sat 96-98 with a plus slider and changeup, it might have been the best start I saw from any Orioles prospect (and I watched multiple Hall, Lowther, Akin, Hanifee, Kremer, and Harvey starts). Now when you look at his stats, they don’t jive with that report I just gave. That’s because he has an awkward, robotic delivery and he doesn’t repeat it well. His command is well below average, but in the second half of the year he got out of whack and couldn’t throw strikes at all. Will Dietz ever throw enough strikes to be a major league pitcher? Will he improve the consistency of his secondaries? 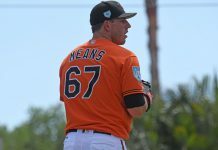 Would a move to the bullpen allow him to simplify things and improve his mechanics? Dietz has the ceiling of a high end late inning reliever or a inning-eating back-end rotation piece, but the floor of never making it out of AA. The raw stuff is what gets him on this list and the extreme risk of the profile is what keeps him this low. He was a raw prospect when drafted, so it was expected he’d be a slow mover, but he lacks the type of athleticism on the mound to give me confidence that mechanical improvements are coming. We think a move to the bullpen is likely and there he can throw some triple digit fastballs and focus on one offspeed pitch. That should be enough stuff to play in a low leverage relief role even without much command.